Flying a kite is an amazing and instructive way to spend my time: helps me to feel like a child. 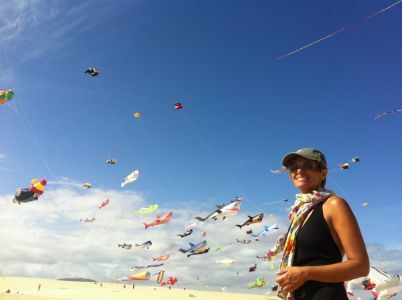 Hundreds of professionals and amateurs of kites since 1987 are gathering in November to the Burro Playa of Fuerteventura, where dunes of white sand meet the endless tones of blue of the sea. From 9th to November 12th we have been able to admire the amazing kites flying in the blue sky of this beautiful island: plenty of colour, able to already increase the incredible charm of this beach, situated in the Natural Park of the Dunes of Corralejo. The festival is now at his thirtieth edition: its resonance increased to turn it into the internationally recognized event that is now, an international event, to which you/they have they participate impassioned of kites coming from the whole world. For all through the event and it was possible to assist to the flight of kites of different typologies, forms and colours pouting over the blue sky of Fuerteventura. There have been exhibitions of classical and static kites, besides the traditional fight among kites Rokkakus. The festival is happening on weekend to allow tourists and residents to enjoy the rich program of the event, that includes a laboratory of flight of kites for children and a suggestive night-time exhibition. Flying a kite is to me a must amazing and instructive way to spend my time, above all if you compare it to lie on the sofa with a tablet in hand. This is good both for young and old: flying a kite, even fighting against a strong wind, in my opinion is an antidote to boredom, to idleness and indolence. But above all is for me a factory of images and cheerful feelings, smiles and memories that I store in my brain, ready to come back to my mind when I need to feel as a child.